The benefits of ePrescribing initiatives are well documented and an increasing number of countries have adopted their use . A € 36,5 Million European Initiative epSOS ran for 6 years ( 2008 to 2014) aimed to design, build and evaluate a service infrastructure that demonstrates cross-border interoperability between electronic health record systems in Europe. ePrescribing was identified in the National eHealth Strategy (2013) as a key priority for Ireland. 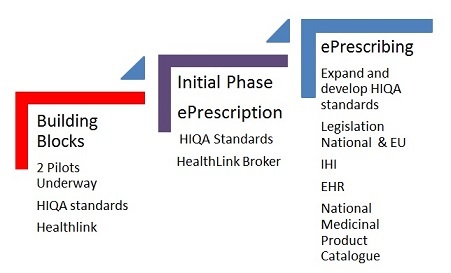 Further to the GP Messaging Standard currently in use , in 2015 HIQA finalised and in March 2015 published their National ePrescription dataset and clinical document architecture standard based on the HL7 Clinical Document Architecture & a Data model for an electronic medicinal product reference catalogue – a National Standard.. Currently there are two s/w vendor pilots underway around the country. Cork Health Innovation Hub ( HIH) / Mc Lernons/Complete GP are piloting their ePrescribing initiative in Mallow, Co Cork . ePharmacy was been adopted as a strategic programme with a commitment to progressing the ePrescribing agenda in Primary Care. Work is also proceeding on Individual Health Identifier ( IHI ), Electronic Health Record (EHR) and National Medicinal Product Catalogue. Full ePrescribing or Phased implementation ….. Following discussions and after reviewing the documentation available, it was decided that the best way to build and test a National ePrescribing solution in a useful and safe manner is to do it in incremental steps. Approval was given to proceed in 2016 with an initial phase that will facilitate the electronic transfer of prescriptions. utilising HIQA standards developed to date and the National Message Broker HealthLink. The collaborative initiative ‘ePrescription’ will ensure a standardised transportation mechanism and supporting infrastructure for the safe electronic transportation of a prescription from a prescribing site system to a dispensing site system. . The ‘ePrescription’ initiative will reduce rekeying of prescription information manually which will speed up the dispensing process and minimise errors. The development where community pharmacists are utilising the Healthlink infrastructure will be a significant milestone that will open up other possibilities for greater electronic interaction between community pharmacies , GP’s & hospitals.